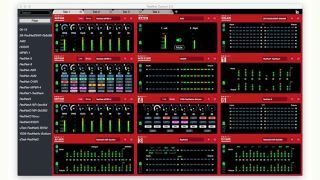 The What: Focusrite has announced a major update to its RedNet Control software system designed to provide remote control for products in the company's RedNet range of Dante-based audio-over-IP systems. The What Else: Based around a web-browser-like tabbed graphical interface, RedNet Control 2.0 is designed to handle the largest RedNet system, with the ability to control up to 600 RedNet devices in total, representing up to 9600 Dante audio channels. Available units in the system can be dragged and dropped from a sidebar list into a grid on a tab. Each tab can display up to 12 devices, and up to 50 tabs can be defined. Devices can be grouped logically and intuitively on each page: a multi-location system may now be rolled out with a tab representing each area of a facility, for example. Individual devices in the Device List sidebar are displayed in italic when they have been assigned to a tab; right-clicking a device enables it to be identified and renamed. The device list can be filtered to display only devices that meet certain criteria, such as sample rate, devices that are not currently in a tab, and other criteria. The device list is also searchable. Tabs in the main screen area can contain either 12 or six devices, depending on the level of detail required. New devices can be added to a tab by dragging from the device sidebar and dropping, and when released they can either replace the existing device in the tab or move everything to the right. Alternatively, the system can populate tabs automatically with devices in the device list. Tab contents can be managed easily with a drop-down menu. The Bottom Line: For systems employed in education, post-production, live entertainment, or sports broadcasting, RedNet systems incorporating hundreds or thousands of signals are now much easier to manage. RedNet Control 2.0 allows for improved device monitoring, metering, and control of the vast majority of device parameters as well as allowing devices to be locked or unlocked for access control. RedNet Control 2.0 is set to be made available as a free upgrade for all RedNet users from December 2016.